﻿ HuntingNut » Forums » Firearms, Shooting & Reloading » Gun & Firearm Discussions » Used Brake Rotors as Gongs. Used Brake Rotors as Gongs. Posted: Sun May 26, 2013 4:33 pm Post subject: Used Brake Rotors as Gongs. I just changed out the pads and rotors on my wife's car. While I was putting the old rotors into the new rotor boxes it struck me that they may make good gongs. I could even put a clay in the centre opening which would be an obvious kill on a coyote and the hit easily seen even at 200 meters without a spotting scope. Anywhere on the gong is a killing shot on larger game. Rotors are tough metal, or so it seems, and they should last awhile. Anyone ever tried this? Posted: Sun May 26, 2013 8:47 pm Post subject: Re: Used Brake Rotors as Gongs. Well Mac if they're cast iron they may shatter depending on the caliber you use on them, cast steel should be a bit more robust. Give it a go and tell us what happens. The actual material thickness isnt that thick if the rotors are ventilated and cross drilled. Posted: Mon May 27, 2013 8:09 am Post subject: Re: Used Brake Rotors as Gongs. Posted: Mon May 27, 2013 9:59 am Post subject: Re: Used Brake Rotors as Gongs. Found out years ago that US made disc brake rotors shattered with the impact of a 243 win. Over here most factory & oem replacements are made from gray cast iron. Posted: Mon May 27, 2013 10:37 am Post subject: Re: Used Brake Rotors as Gongs. Omni is tight. They are cast iron. Handgun and lead rounds only I guess. I may sacrifice one to a. 223 just to see if it can take it. I have seen what happens to a cast iron engine block sitting in a old 2.5 ton truck when hit by a 50 calibre from an HMG. That was one of the best shoots of my career. Walked it up in the sand at Petawawa out to about 1400 meters. Posted: Wed May 29, 2013 5:08 pm Post subject: Re: Used Brake Rotors as Gongs. If you can find a higher end performance vehicle you might find some steel or stainless steel rotors. Most won't withstand high powered rifle bullets anyway. 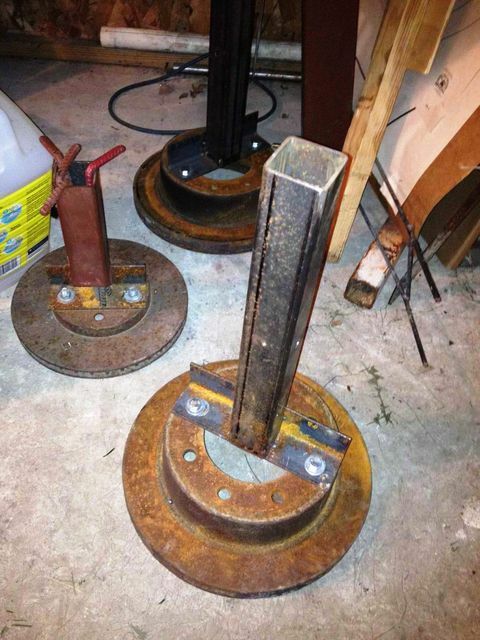 Posted: Wed May 29, 2013 8:39 pm Post subject: Re: Used Brake Rotors as Gongs. Keep thinking out of the box, MacD! Posted: Thu May 30, 2013 12:04 am Post subject: Re: Used Brake Rotors as Gongs. Nothing ventured, nothing gained Mac...give 'em a try mate. I used a brake drum for cast pistol bullets at 25 and 50 metres and it stood up to the "ringing" no problems. Brake rotors are significantly thicker than brake drums, so it will be interesting to see how they go. As Bushy said...before and after pics mate. Posted: Thu May 30, 2013 10:42 am Post subject: Re: Used Brake Rotors as Gongs. So went to the range today and brought a rotor. Only problem is I left my locked ammo carrier sitting in my workshop. It is an 80k round trip to the range so I declined to return to get it. On a bright note I stopped and bought a box of 158 LRN on the way so I got to christen my new Blackhawk. It shoots a bit high and to the right but I am going to do some more plinking before I start adjusting sights. It is most likely me not the revolver. I promise pictures when I go out next with the rotors and some ammo. As an aside there were 3 RCMP tactical squad members out today firing C7 carbines. They were fully decked out with holo sights, flashlights, front post grips and fully adjustable stocks. I tried not to drool too much. They fired several hundred rounds but alas regulations say they have to bring back the fired cases. All LC brass and again I had to watch my drooling. Posted: Thu May 30, 2013 2:04 pm Post subject: Re: Used Brake Rotors as Gongs. I use the brake rotors as portable target stand bases. I weld a piece of 2"x2" square stock to some angle iron with holes drilled at the lug spacing. Then bolt the square stock pointing stright up into the top of the brake rotor. 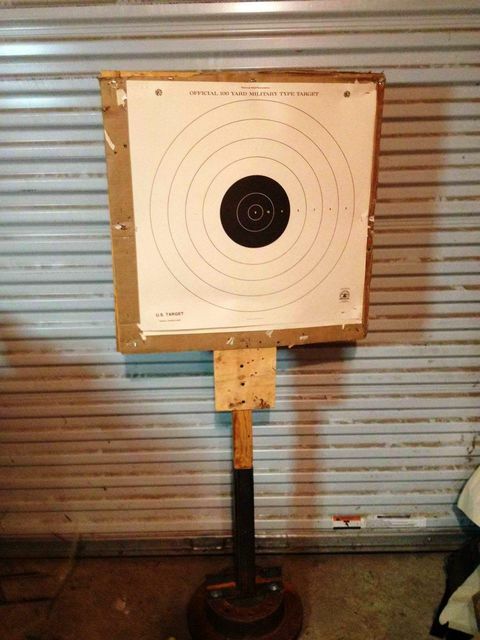 I use a 2x2 piece of wood to make my target frames and stretch a piece of carboard on the frame and set it in the holder. Staple on a target and shoot away. On a really windy day I will drive a piece of re-bar rod through a lug bolt hole to keep it upright but a heavy brake rotor off of my 3/4 ton truck stays put pretty well. I will try to post pictures later. Posted: Thu May 30, 2013 7:38 pm Post subject: Re: Used Brake Rotors as Gongs. Posted: Thu May 30, 2013 7:40 pm Post subject: Re: Used Brake Rotors as Gongs. Good use for old Rotors - I have three set up like this. Posted: Thu May 30, 2013 7:44 pm Post subject: Re: Used Brake Rotors as Gongs. Dawgdad, I'm going to copy you! 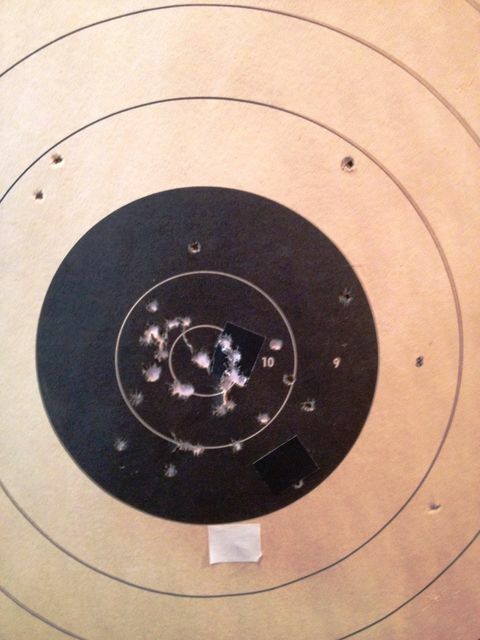 However, I expected to see a nice grouping in the x-ring. Posted: Fri May 31, 2013 3:53 am Post subject: Re: Used Brake Rotors as Gongs. I will shoot one for you today. Posted: Fri May 31, 2013 3:58 pm Post subject: Re: Used Brake Rotors as Gongs. 40 shots on this backer - 10 standing un suppprted - all 8's and all but 1 9 are from standing, 10 rapid fire sitting from standing with a reload. ( 2-8),10 rapid fire prone from standing with a reload. ( 2-8), Rapid prone is on a different target with tighter rings and slow prone is tighter rings yet. I staple these centers over this backer.